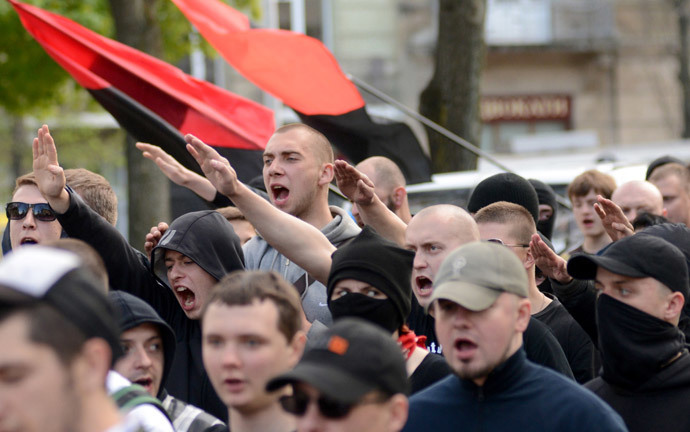 Foreign Policy magazine – Russia’s fierce critic – met with the leader of Azov Battalion, an irregular force assisting Kiev to cleanse eastern Ukraine of “terrorists.” The group boasts fierce tactics, “values far from European,” and Nazi-like attributes. 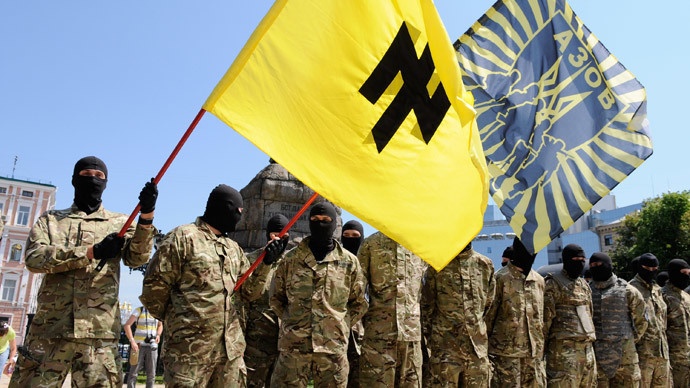 Azov, which has an estimated personnel of 500 people, is one of about 50 volunteer battalions formed by Maidan activists and ultranationalists of the Right Sector group. These newly formed units have been brought to eastern Ukraine to form the backbone of the forces fighting against the local self-defense militia advocating independence from Ukraine. 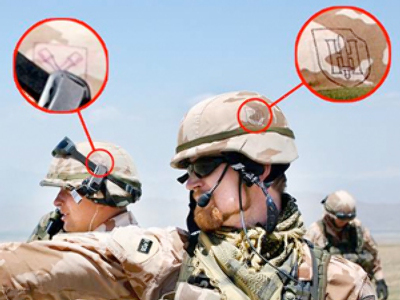 The Azov Battalion actively participated in Kiev’s so-called “anti-terrorist operation” and, like most of the volunteer and National Guards units, has been accused of committing war crimes against civilians. 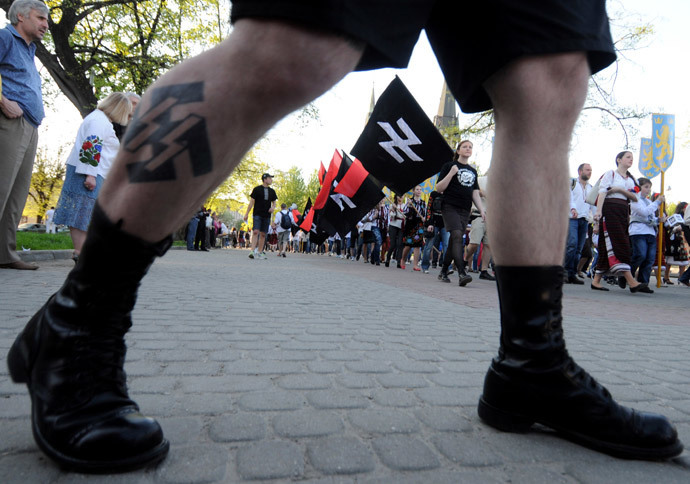 The unit adopted as its logo a mirrored Wolfsangel (wolf trap) symbol that was widely used in the Third Reich and has been associated with neo-Nazi groups worldwide – Ukraine included. It is most widely known as an emblem of the SS Division Das Reich. 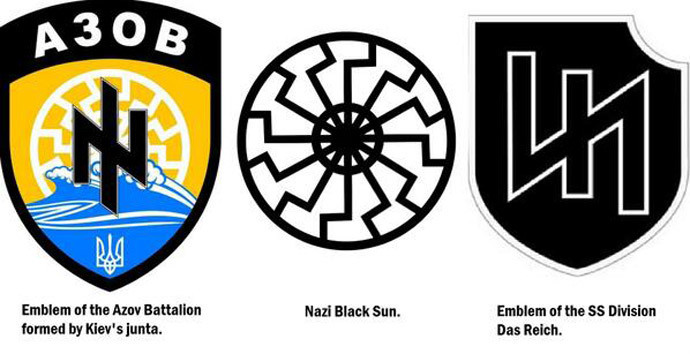 Azov’s emblem also includes the “Black Sun” occult symbol beloved by the Nazi SS, Foreign Policy reports. 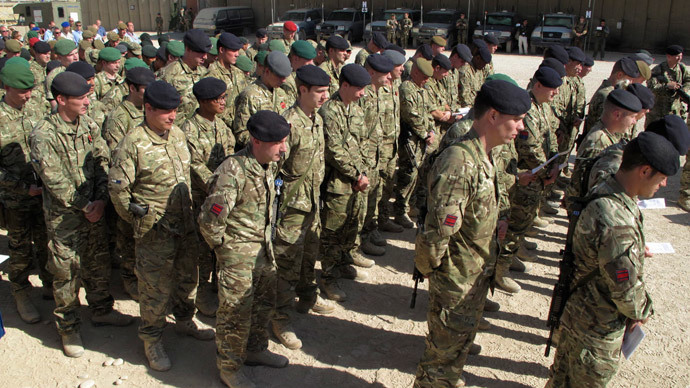 The battalion is sponsored by Ukraine’s third-richest oligarch, Igor Kolomoysky. 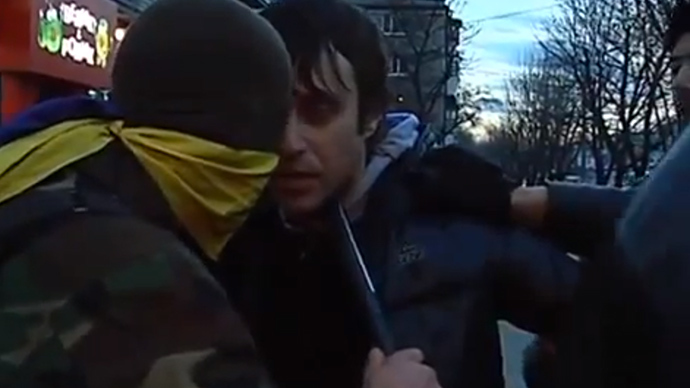 He is governor of Dnepropetrovsk region and sponsors a number of other paramilitary units. Kolomoysky has not only used his men in direct deployments against eastern Ukraine militia; he also appears to have been behind the attack on the Russian embassy in Kiev on June 14, when several hundred Ukrainian protesters rallied outside the Russian diplomatic mission. 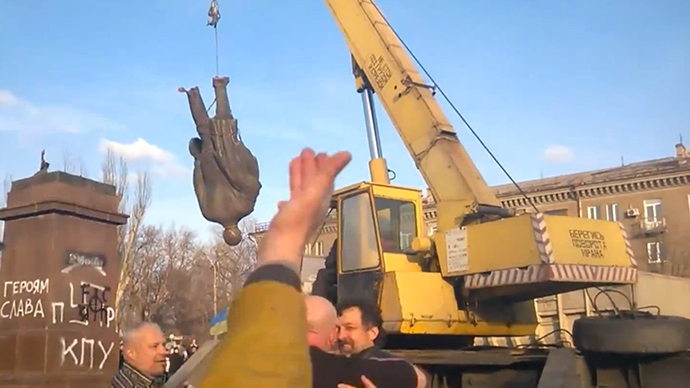 The demonstrators threw stones and Molotov cocktails, and overturned several diplomatic cars. The leading players in the attack on Russia’s embassy were “fighters from Azov Battalion, created and financed by Igor Kolomoysky,” Russian Foreign Minister Sergey Lavrov declared two days after the attack. Oleg Odnorozhenko, deputy commander of the Azov Battalion and historian by trade, told Foreign Policy that the Ukrainian forces are facing “thousands of regular Russian Army troops,” and told a story about dozens of captured Russian soldiers and a destroyed Russian fighting infantry vehicle. However, he failed to provide any evidence or show any prisoners to the Foreign Policy correspondent. “Mariupol won't be taken without blood,” Odnorozhenko promised, adding that the Ukrainian forces are building fortifications and “activating different military groups” in the area. 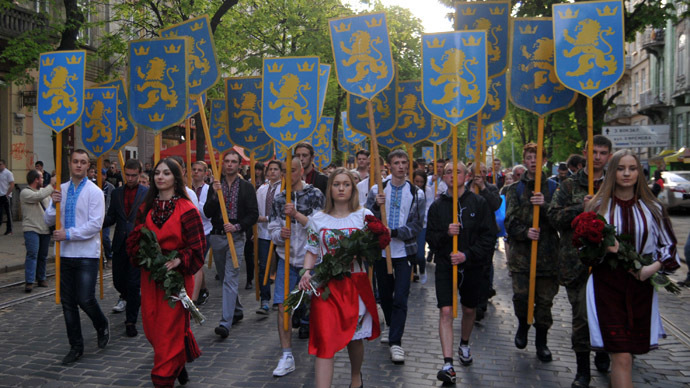 In reality, Ukrainian nationalists of the Organization of Ukrainian Nationalists (OUN) and the Ukrainian Insurgent Army (UPA) killed hundreds of thousands of Jews, Poles, Belarusians, Russians, and fellow Ukrainians during WWII. German occupation forces tended to form Einsatz groups that eliminated the civilian population with the help of Ukrainian nationalists. 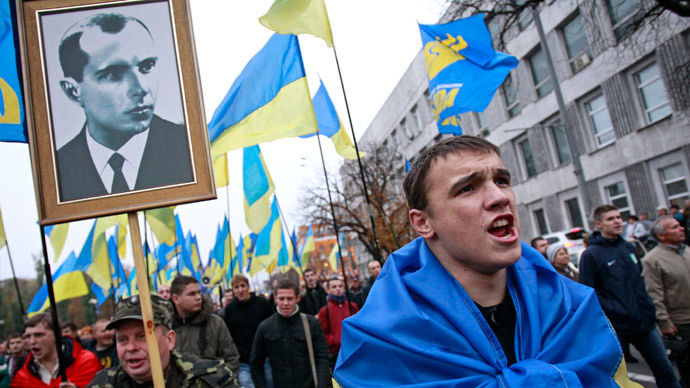 In Kiev alone, the number of those executed – mostly Jews – reached up to 150,000 victims, and the same policies were implemented in all occupied Ukrainian cities. Odnorozhenko, however, tailors history to his needs. 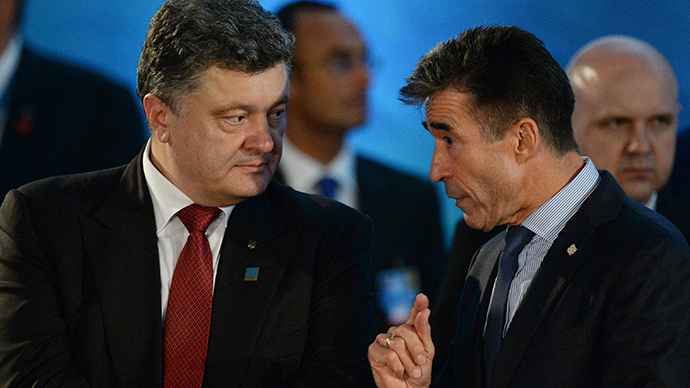 When calling on Europe to provide assistance to Ukraine, he actually compares his unit to predecessors from OUN-UPA who fought Soviet troops during WWII to justify such assistance. “We have the kind of normal war that was last seen in Europe in 1945,” Odnorozhenko said, also omitting the chain of wars like in the Balkans that first led to the disintegration of Yugoslavia, and then blew Serbia into a number of states.